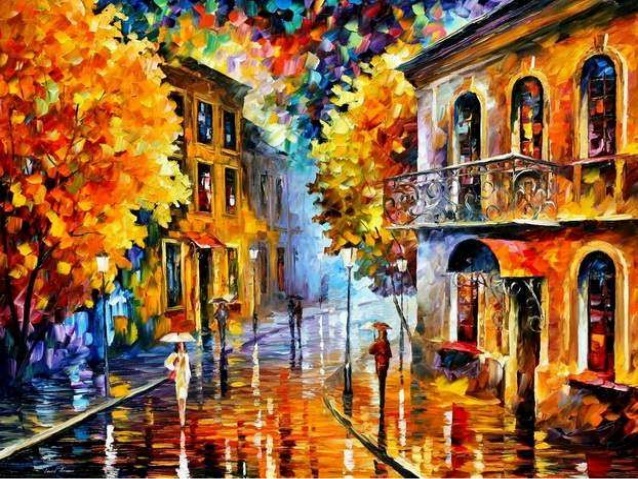 “Blues of Falling Leaf” by Leonid Afremov, used with permission. In “Miss Congeniality”, sweet, innocent, slightly obtuse Miss Rhode Island responded when asked to describe her perfect date, she sweetly responded, “…April 25th. Because it’s not too hot, not too cold, all you need is a light jacket.” I must disagree with Miss Rhode Island and submit the perfect date would probably land between September 23 and December 21, preferably in October before the time change. I was walking to the main office this morning and was illumined with the fact that autumn days are indeed the best days. The heat of summer has mellowed to a cozy warmth – Indian Summer excepted – and is coupled with cool evenings that automatically compels one to bake, build fires and read books. For the highly energetic, much sewing can be done. These days are equally split, for the most part, between night and day, approximately 12 hours each. I can’t get enough of autumn days. Not only is the season packed with the best holidays of the year, it is a time conducive to contemplation and meditation. I am not saying anything new to other fall-a-philes. The air is magically refreshing, the wind delightful, and, as you can see, the sunsets are off the hook. Spring is nice, but it’s still too cold. The boys of spring are putting their gear away, the boys of autumn are in full swing and basketball has hit the courts again. It was, as I have said, a fine autumnal day; the sky was clear and serene, and nature wore that rich and golden livery which we always associate with the idea of abundance. The forests had put on their sober brown and yellow, while some trees of the tenderer kind had been nipped by the frosts into brilliant dyes of orange, purple, and scarlet…As Ichabod jogged slowly on his way, his eye…ranged with delight over the treasures of jolly autumn. When nature heaves her dying breath in this glorious season, it leaves us breathless with her beauty. Breathless as she blows toward the tomb of winter, the tomb of the past year, the womb of the next.